One of the last great temperate wilderness areas on Earth, Tasmania's dramatic ancient landscapes are your constant companion, as outdoor escapes become epic adventures. Ascend the tallest sea cliffs in the Southern Hemisphere on the Three Capes Track, resting easy in comfortable cabins overnight; climb jagged mountain peaks carved out by ancient glaciers at Cradle Mountain; and journey deep into the south west wilderness to feel like you’re the only soul on earth. Tasmania might be at the edge of the world but it isn’t just for hardy explorers. There are many iconic walks across the island, which can be enjoyed hand in hand with gourmet food and wine. We invite you to breathe the world's cleanest air while you experience the natural and cultural wonders of Tasmania. 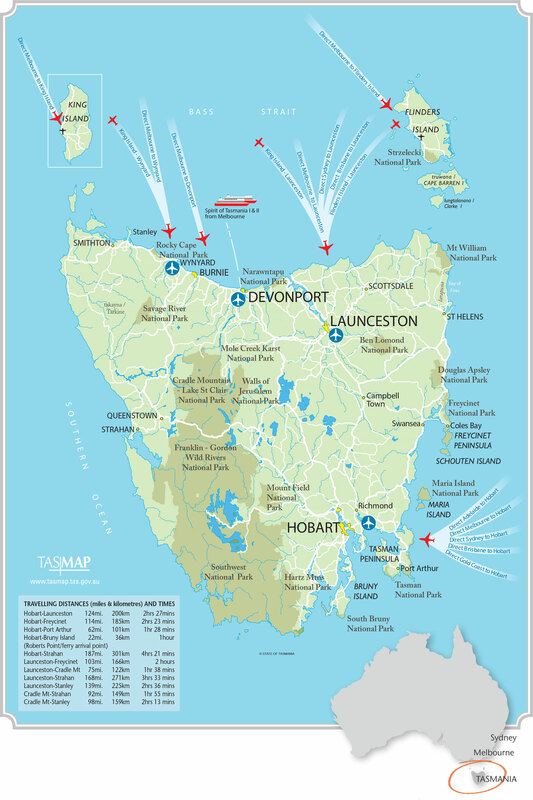 Tasmania, is Australia’s only island state and is also the smallest and most southerly state. Tasmania is around the same size as the Republic of Ireland, West Virginia, Hokkaido and Switzerland. The Tasmanian Wilderness World Heritage Area is one of the largest conservation areas in Australia, covering almost 20 per cent of Tasmania. More than 40 per cent of Tasmania is made up of World Heritage Area, national parks, conservation areas and reserves. Tasmania's has 19 national parks encompassing a diverse range of habitats and ecosystems, offering refuge to unique plants and animals, found nowhere else on Earth. Tasmania is a refuge and habitat for rare plants and animals, including survivors of the ancient southern super continent, Gondwana and widlife now extinct on mainland Australia. The main island of Tasmania is at the centre of a cluster of 334 islands with a coastline of more than approximately 5400 kilometres. Tasmania is home to the highest sea cliffs in the Southern Hemisphere, rising three hundred metres from the ocean. Australia’s heaviest waves can be found at the legendary Shipstern Bluff. Tasmania has more than 2000 km of walking tracks and 19 national parks. Tasmania's Central Highlands are home to thousands of inland lakes and waterways. Tasmania is home to some of the best temperate diving in the world. Dive shipwrecks and giant bull kelp forests with seals and leafy seadragons. Mona, arguably the most controversial private collection of modern art and antiquities in the world is located in Hobart, Tasmania. In 2008 the Tasmanian devil was declared to be endangered with a facial tumour disease threatening the survival of the species. Breeding and isolation programs have been relatively successful ensuring a future for the cute and feisty mammals. Though the Thylacine (Tasmanian tiger) is considered extinct, there have been many unsubstantiated sightings by those who have ventured into Tasmania's remote south west wilderness. Founded in 1804 as a penal colony, Hobart is Australia’s second oldest capital city after Sydney. Crossing the Bass Strait to Tasmania is easy. Take a direct flight departing a major Australian city, it's only a one-hour flight from Melbourne or 2 hours from Sydney. Or travel by sea on the passenger ship, Spirit of Tasmania. Join Wilderness Travel to discover the best of Tasmania, from Cradle Mountain Park to the Freycinet Peninsula, hiking stunning trails and savoring Tassie’s wonderful food and wine scene.